The course will give students an insight into the life of the messenger of Allah ﷺ, looking at key moments from the hijra to Madinah and his ﷺ early years in Madinah in great detail. Critically looking at the battles, struggles and community in Madinah. It is of the utmost importance for a muslim to emulate the Messenger ﷺ, in order to do so we must know him. -To increase in our love for the beloved of Allah ﷺ by sharing in the experiences he had in his lifetime. 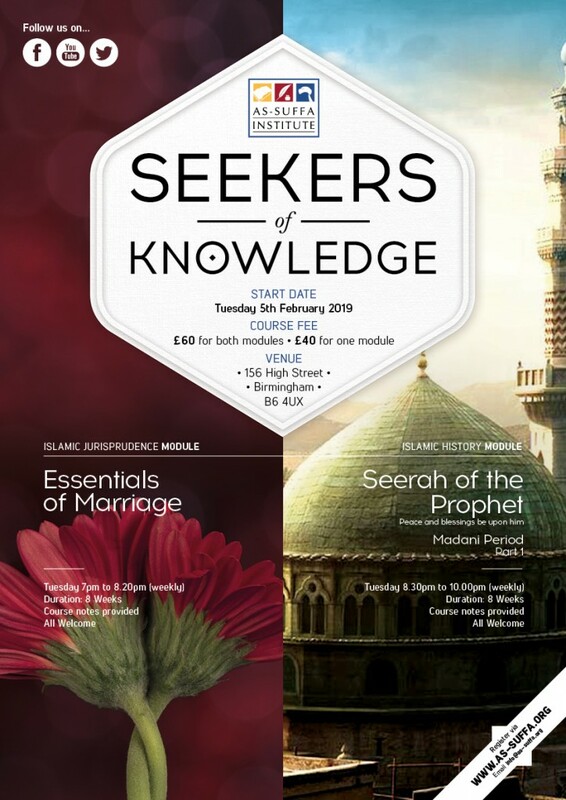 For individuals who cannot devote their time for full-time islamic studies and anyone wishing to gain a comprehensive understanding of the blessed seerah. The course will be providing students with the essential rulings pertaining to marriage. The course will cover everything from looking for a spouse, the rulings related to marriage as well as advices on how to sustain a healthy relationship and brief details on parenting. Throughout the course, where relevant the course will address contemporary issues faced by Muslims, particularly in our communities today. -Learn how to attend your obligations not only to Allah but also your spouse and children. Anyone wishing to learn the rulings of marriage, regardless of their previous studies whether recently married or looking to get married. Married couples who may not have previously had the opportunity to study or have unanswered questions.